I’m not too sure how we ended up in the middle of June so quickly, but the official start of summer is this Sunday! Which coincidentally is also the date for the Garden Party Trunk Show. We have some familiar faces and also quite a few new vendors at this show. I’m excited and I’ll be on the lookout for a bunny of some sort to add to my collection. We had the pleasure of having Krystal Speck and her colourful ceramics at the Love & Rummage Trunk Show and it’s a treat to have her back. I just love the folkloric imagery and saturated colours she uses. 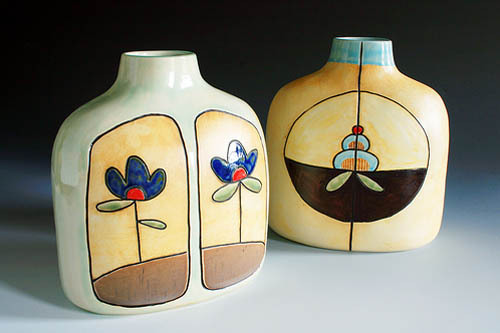 With wedding season upon us, I think her lovely vases would make a beautiful wedding gift or perhaps just a summertime gift to yourself. 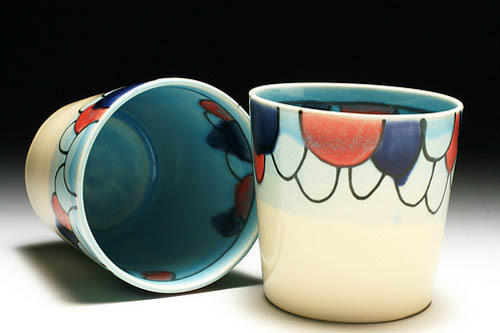 You took both textiles and ceramics at OCAD… How do you feel that textiles have influenced your ceramic work? Do you still do textile-based work? Krystal : Textiles have played a huge role in my life…my mom’s fabric collection was the greatest discovery I made as a child. I think her gloriously patterned fabrics were what originally inspired me to be artistic! Clay came into my life much later. As a result, I can’t seem to paint a pot without looking to textile patterns first for inspiration. I still sew whenever I can find time, though my sewing machine is angry at me right now for neglecting her. I hope to eventually incorporate textiles into my product line, and have my two loves come together again: clay and cloth! 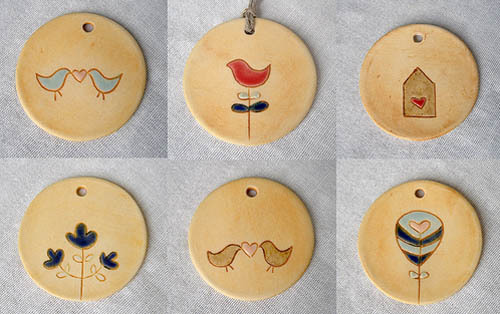 You wrote a great post on sustainable ceramics. As an independent artist, have you found it challenging to ‘green’ your practice? Have you been able to incorporate any changes that you are particularly proud of? Krystal : Yes, you would assume that as an independent artist it would be easy to make your art practice very sustainable. But I’ve discovered it really depends on your chosen medium and your financial situation. For example, I would love to own a solar-powered kiln but this isn’t a viable option at the moment (for both monetary and geographical reasons). There are some small things I’ve been trying at my studio such as: collecting and filtering my used water to remove glaze ingredients that would otherwise be poured down the drain, reclaiming my slip (liquid clay) and bagged clay to be reused, and firing full kilns with work I’m pleased to fire into permanence. I know you’ve recently started an entrepreneurial program. What is the most useful thing you’ve learned so far about business? Krystal : I’m currently taking part in Bizstart, an amazing eleven-month business incubation program started by YES (Youth Employment Services) which allows you to work full-time towards launching your own company. I think for creative business people, the most important factor is learning to price your work correctly and confidently. We all love to spend our time designing and making, but you have to sit down and “crunch” the numbers, as they say. For example, I see a lot of crafters selling great products for low prices. This is good when you’re starting out, but once you cross over in to becoming a business you have to make sure you’re paying yourself for your time and talent! 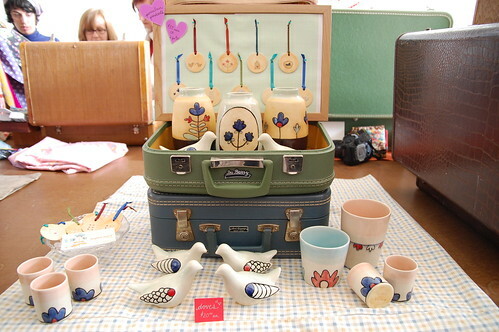 Happily, I think people are gradually becoming more aware of the value of handcrafted objects and are willing to pay fair prices for handmade. Sunday marks the first day of summer. What do you most look forward to in the Summer?